Please read this info before you purchase. Maybe one percent of our customers wind up unhappy with their purchase but that is one percent too many. All our poultry feeder does is keep feed safe from rats, birds, and other vermin. It is simply an inexpensive treadle feeder that works. that are unwilling to spend two hundred dollars for a chicken feeder. Our feeder does one thing; keep rats and other critters out of the feed. 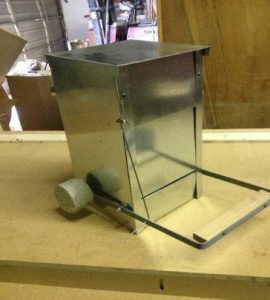 It isn’t the prettiest feeder on the market but it really will defeat vermin and it is affordable. If you need a bird proof chicken feeder, this one is the best. If you need a rodent proof chicken feeder this one is the best. If you are the kind of person that needs perfection and ultra high quality you will not like this feeder! It is sturdy enough to last for many years but if you have OCD then you will not like this feeder. That said we have dozens of customers that have bought additional feeders after seeing how well they work. If your feeder ever breaks we will furnish parts for the cost of shipping Here are some videos of the construction details and the assembly needed to put the treadle on the feeder after it arrives. It does require some tools, pliers, a crescent wrench or open end wrench and you will need to adjust the treadle by bending it a bit till it fits. Easily done as the steel is 1/8″ thick but it has to be done by the customer for it to fit right. Three minutes to five minutes will suffice to unpack and install the treadle, counterweight, and wire link. If you are in the city you won’t have neighbors complaining about the rats that are attracted to your coop. One more reason that the City Council might allow citizens to raise chickens in backyards. Chickens and rats don’t have to be synonymous. Birds train quickly with our style of feeder, the door swings away from their head, not over their head so they are less afraid. The door will push a bird’s head out of the way instead of trapping the bird. The Grandpa treadle chicken feeder had such a problem with birds getting trapped that they had to add side guards. The birds don’t have to reach deep inside the feeder to eat like some of the competing brands so our rodent proof chicken feeder will work on medium and large birds too. It is solidly made and it actually will defeat rats, wild birds, and some customers say squirrels. There is a gorgeous new feeder on the market, just pretty and neat as all get out but it has a plastic lid and a plastic treadle. Not only that, but the treadle is huge and will allow rats and wild birds to defeat the feeder! Plastic degrades in sunlight, rats easily chew through plastic, and using plastic saves money but spending a few dollars more on sheet metal will make a feeder last for years. 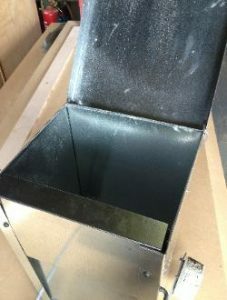 The medium rat proof treadle chicken feeder hopper holds 26 pounds of laying pellets or other feed and has a 100% galvanized sheet metal feed tray and hopper so the feed flows easily and sanitation is assured. Generally a laying hen eats around 4 ounces of feed per day, so one pound of feed should feed four birds one day, 7 pounds per week per four birds, or 3 1/2 weeks per full hopper of feed for a four hen flock. 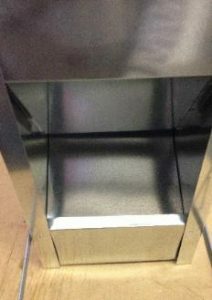 Approximate assembled size of the medium feeder is 18” deep x 14” wide x 19” tall. Shipping weight is around 15 pounds with packaging for the medium rat proof treadle chicken feeder. In a hurry to start saving money and feed? Above is a photo of a commercial organic free range chicken operation that researched every chicken and poultry feeder in existence before choosing our feeders. Below is a video that will show one case where a customer insisted that the feeder was “defective” and that the treadle had missing holes preventing the treadle from being assembled. The feeder took three minutes to unpack and assemble and was in perfect condition and was not defective in any way. Training your birds is very easy and quick IF you remove all other feed sources from the coop.The hens learn very quickly that stepping on the treadle meant that they got to eat! If they don’t pick it up in five minutes, wait a few hours till they are hungry then trip the treadle a few times so that they see the food.We have had maybe a dozen people email claiming their birds wouldn’t use the feeder and in all cases they were providing other sources of feed for the birds, hadn’t assembled or installed it correctly, or they tried to block the door open while “training” their birds. What they did was train the birds that the door wasn’t supposed to move when they used the automatic treadle feeder! There is a small, narrow, wedge shaped gap between the sides of the door and the front flanges which is required due to the door design but mice, rats, or other vermin can’t get inside due to the slickness of the galvanized metal. They can’t climb the slick metal feeder to get to the gap. The bottom of the door closes tightly but the door design requires a space to operate properly preventing us from eliminating the narrow gap. The Feeder is assembled using pop rivets, screws, and bolts. No spot welding that will break a few years down the road. The vermin proof chicken feeder was designed using feedback from chicken owners on the forum at backyardchickens.com. 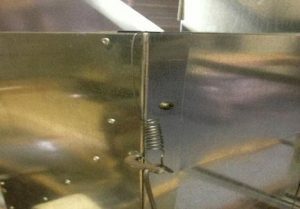 The treadle feeder evolved through several versions from a plywood feeder to a very solid galvanized automatic metal feeder thanks to the feedback from the backyardchicken.com forum members. The vermin proof chicken feeder is constructed of light weight 30 gauge, 26 gauge, and 24 gauge galvanized steel construction with steel treadle arms for reliable operation under harsh conditions. The treadle arms bent out of one long piece of ¾ x 1/8 steel bar to make it stiffer and more durable. door hinging system employs an integrated 1/4 crank rod that should last for decades. Replacement parts will always be available should the need arise. disassembled for packing. Reducing the size of box by removing the treadle cuts around 30% off the shipping costs. There are instructions on how to put the treadle back on, about a five minute operation if you are a klutz. The wire\crank rod does need to be bent under to secure it so a pair of pliers is needed and a 7/16 wrench to tighten the nylon locking nuts. If you have deep litter in your coop you might want to set the treadle feeder around two to three inches off the top of the litter by hanging the rodent proof chicken feeder on the coop wall. The birds will hop right on the treadle just like it was a roost pole but let the treadle bottom out on the litter for stability. attached to a larger base or fastened to the coop wall to prevent tipping when empty. A wooden mounting block is included with the feeder. We un-box each rodent proof feeder for a quality inspection before shipping to our customers. We are still committed to recycling or diverting waste wood from landfills so we bring the feeders in missing the hardwood treadle step and softwood spacer block which are produced from hardwood scraps and surplus pallets from material deliveries. You started searching for a rat proof chicken feeder or a treadle feeder because you have a rat problem, a wild bird problem, or a squirrel problem. There are dozens of articles by well meaning but inexperienced “experts” telling you how to rat proof your coop, how to trap or poison the rats. That is expensive, unsafe, and if you read the comment sections on those articles usually useless! What does work is using a rat proof chicken feeder with a heavy counterweight and a spring loaded door. As soon as you stop the rats and wild birds from eating your chicken feed they will leave the area and spend their time scrounging food as nature intended and not eating your expensive chicken feed. You have a choice if you are going to have chickens and rats or just chickens. If you follow our instructions your birds will learn to use the feeder quickly.